Using PIM in sparse mode is much more effective, because of the explicit requests. A multicast packet is only flooded from the sender to the first hop router. Only when a client requests data, the multicast packets are flooded out of the broadcast domain. The core control point of PIM-Sparse mode is the Rendezvous Point (RP). The RP tracks all the senders and receivers in the multicast domain. In the figure below the loopback 0 of R1 is configured as the RP address. OSPF area 0 and PIM in sparse mode is enabled on all interfaces of all routers. 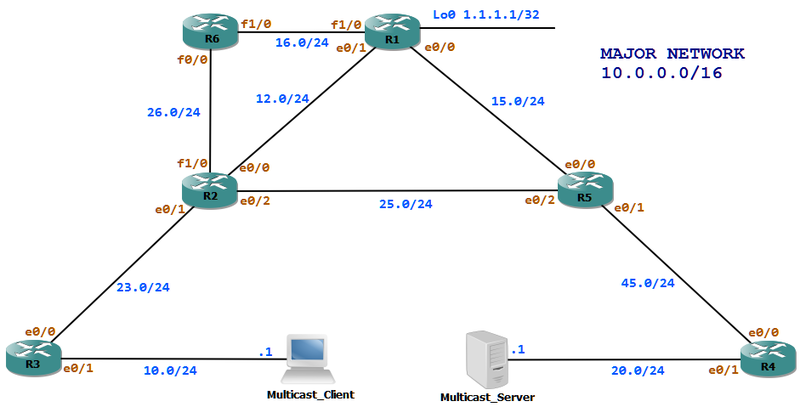 Let us check the scenario when a multicast receiver joins to a group. We assume now there are no senders. Client sends an IGMP membership report out on the LAN. IGMP join will then the converted to PIM join and sent upstream to the RP.